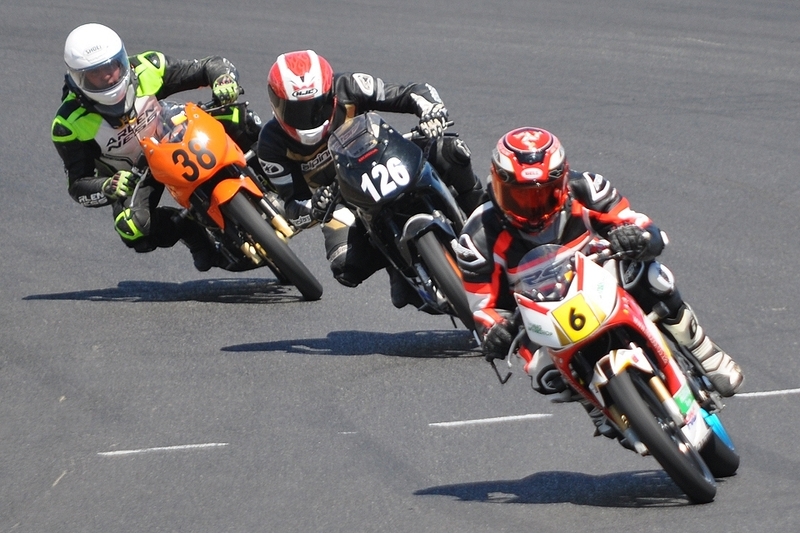 There was tight racing in all six disciplines at Round 1 of the Club/Regional Short Circuit series at Killarney International Raceway on Saturday 2 March – although not always for the lead. Multiple Regional champion in Powersport and the 600 Challenge, Hayden Jonas, dominated the CBR150 Seniors races on a bike he and his father had bought on impulse a few days before – even after starting Race 3 from the back of the grid! He won all three races going away to score maximum points for the day, but behind him things were not so clear-cut as Gareth Dawson, Raymond Alexander and Willy van Niekerk battled it out for the minor placings. Alexander crashed out of second in Race 1 but rejoined to come in eighth, while Dawson finished second and Van Niekerk third. Alexander came back strong to post a hard-fought second in Race 2, ahead of Dawson and Van Niekerk, but lost out by a bike-length to Dawson in Race 3, to finish third for the day behind Jonas and Dawson. Talented teenager Slade van Niekerk took all three CBR150 Junior races, while Nicholas Hutchings and David Lindeman put up superb dices for the minor placings, which went Hutchings’ way in Races 1 and 2, only for Lindeman to strike back in Race 3 with a hard-fought ride to second. Jurgen van Onselen returned from a long absence to rule the Super Motard races but once again there was action aplenty for second and third, this time between Franco Flach (two seconds and a third) and Paul Lightheart (one second and two thirds) who banged elbows on almost every corner in a superb three-round contest. Tony Sterianos, on a beautifully prepared Honda 250 (the bike incorporates parts from several different models and is an absolute work of art) walked away with the Super Singles honours for the day while behind him David Vismer and Andrew Liebenberg debated second. Vismer got the better of it in all three races, but not by much after solid rides from Liebenberg, who revealed afterwards that he was riding a borrowed Aprilia RS125 – and that he had never before race a two-stroke machine on this circuit. Ryno Pentz dominated the Formula Ms, which were reduced to a very thin field after Darren Liebenberg crashed out in Race 1. In all, only four drivers scored points. Ebrahim Saalie had to work harder for his three Superkart wins, however, while behind him Taahir Saalie and Mark Hailwood finished second and third respectively in Race 1. Hailwood and Piet Fourie took the minor placings in Race 2, with Fourie and Grant Poultney second and third respectively in Race 3 at the climax of an eventful day’s racing. The next round of Short Circuit racing at Killarney International Raceway will be run on Saturday 30 March – see you there!